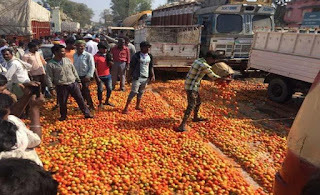 As of now, tomatoes are being sold for more than Rs. 80 per kilogram across India. In major metropolitan centres like Delhi and Mumbai, they are in fact even costlier, around Rs 120 per kilogram. Such a significant hike in the price of tomatoes, a staple in almost every Indian kitchen, hits the low income group the hardest. It compromises any opportunity for the little savings they could have had, and exposes them to serious economic risks. Just a month ago however, the tomatoes had almost no buyers, when the hapless farmers tried to sell them. Their prices had crashed down to Rs 1 per kilogram, again, across India. They did not return even the cost for many of the producers, who had then been forced to dump tonnes of them on the roads! 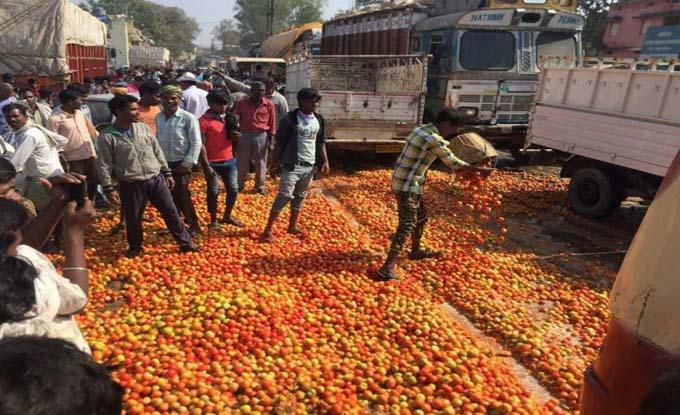 The story was the same across all major tomato producing areas- Andhra Pradesh, Tamil Nadu, Karnataka. So how did tomato prices succeed in skyrocketing from Rs. 1 for farmers to Rs. 120 for consumers in just a month, an almost impossible jump? The intermediaries, of course, have their answer ready--the unseasonal rain in several areas. The wholesalers of Delhi had their culprit--unseasonal rain in Uttar Pradesh, Maharashtra and Haryana, affecting the supply. The wholesalers in Mumbai, curiously, had the same unusual rain as their culprit, without explaining how rain in Maharashtra could affect supply within Maharashtra so drastically! Moreover, no one is able to explain how this curious tale keeps recurring, year after year, tomatoes after tomatoes. Not to mention onions, pulses, brinjals, and whatever else. No one explains if there is any method to the extreme price swings, which are always against the interests of the producers and end consumers. The prices of produce will crash just after the harvest, causing huge losses and severe distress to the farmers, often leading to suicides. There will always be a readily available reason for the crash, usually bumper production. Then the prices will skyrocket for the consumers. Again, a reason will be readily available; something disrupting the supplies from the farm to the end markets. Let us examine the recurrent reason of bumper production. How does the government fail to monitor the sowing pattern, despite having revenue clerks and village development officers at every village, year after year? Moreover, the government is aware that the sowing pattern is clearly linked to three things: minimum support prices (MSP) for government procurement, storage facilities and the cash requirements of farmers immediately after the harvest. While the MSP are not applicable to perishable produce like tomatoes, they do have a major affect in sowing patterns of grains and pulses. A significant increase in the MSP for any particular produce leads to excessive sowing and, monsoons willing, a bumper crop. This in turn leads to the government’s inability to buy it all back, and pushes the farmers to the mercy of the market. An example of this was seen this year in the price crash of pulses in Maharashtra, especially Toor Dal, causing massive distress to the farmers! So why does the government not monitor the sowing patterns and put incentives on diversified sowing? The second is poor storage facilities, coupled with the smaller shelf value of perishable produce like tomatoes. In fact, even in places where cold storage facilities are available, the cost often becomes far more than the returns the farmers would get. The two factors together force the farmers to sell produce at very low costs to the hoarders, or even dump them. Aware that this occurs, year after year, why does the government not invest in storage facilities or desist the farmers from sowing the same crop en masse? Third is the dire need of money farmers have immediately after the harvest. Agriculture requires months of investments before getting returns. Most of the farmers make their investments by taking loans, thus exposing them to risks ranging from crop failure to bumper crop leading to a crash in the price. Why then, does the government not put in place some protective regime to at least offset the loss of investment? It does this for the industrialists by throwing in a lot of incentives on their projects after all! This leads to the biggest question--is the government’s failure here due to neglect or design? A comprehensive agricultural policy with emphasis on both grains and non-grain food produce, like potatoes, would help to counteract current market risks that scare many of the farmers from producing them. The government could easily invest in building cold storage facilities, helping both producers and consumers. It has all the necessary infrastructure in place, from manpower in the form of revenue clerks in every village, to Mandi Samitis (Government’s own market committees) in almost every single district of India. Why it doesn’t do that, then, is anybody’s guess. And until it does, tomatoes will keep bleeding both the farmers and consumers. So will onions. And potatoes. And pulses.